If the default scrolling capture methods fails (an error message appears, incomplete capture, or poor quality), select another capture profile. These profiles were added to Snagit 12.4 and later. Snagit 12.4.1 can be downloaded here. If you install 12.4 over an older version of 12, you may not see the profiles by default. To add these profiles, double-click the profiles located at the bottom of this article. 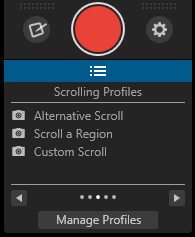 The Alternative Scroll profile functions the same as the default Print Screen or red button capture, but uses different code to handle scrolling. 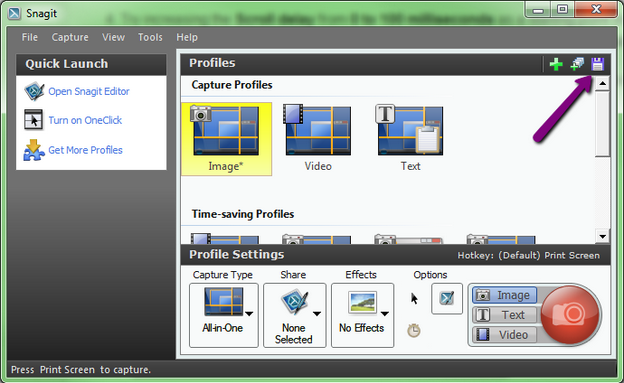 In the Capture window, click the View Profiles button. Click the Alternative Scroll profile to start the capture. The Custom Scroll profile allows you to select a scrollable area on the screen. Click and drag to select an area on the screen. Click the application or web browser's scroll bar to start the scrolling capture. The Scroll a Region profile allows you to click and drag to select an area beyond the viewable content on the screen. This video shows an example of how to use this profile. To learn how to use auto scroll and some scrolling best practices, watch this tutorial video. In the Profile settings, click Capture Type > Properties > Scrolling tab. Uncheck the Use fastest scrolling method option. If that does not work, increase the scroll delay. In Snagit, click the Save button to save your changes to the capture profile. You should now be able to take a scrolling capture. You may need to repeat steps 2 through 5 to test different scroll delay settings. As a workaround, use the Custom Scroll profile. Some Firefox Add-ons cause Snagit to only capture the visible screen. Add-ons that emulate running another browser within Firefox, such as IE Tab Plus, are known to cause this. Disable or remove these types of Add-ons to resolve the issue. The Custom Scroll profile is another option to capture a scrolling area in Firefox. The All-in-One Capture method does not work with PDF readers because Snagit is unable to properly detect the scroll bars on the screen. The scrolling arrows do not appear. To capture a PDF or multi-page PDF document, use the Snagit Printer. In the PDF reader, select File > Print. Print the PDF to Snagit. Snagit sends the PDF document to Snagit Editor. You can edit the captured PDF and save in any of the formats Snagit provides. If you are unable to use the Snagit Printer, use the Custom Scroll profile. If scrolling capture stops after the first page of the PDF document, set Adobe Reader to Continuous Viewing. In Adobe Reader, select View > Page Display > Single Page Continuous. If the first page is repeated when taking a scrolling capture in Adobe Reader 8, download the latest version of Adobe Reader. There is an issue in Adobe Reader 8. Select File > Print > Snagit Printer to capture the PDF document with the Snagit Printer instead of the scrolling capture method. Click the Finish Profile option in Snagit Editor to save the pages as a PDF document. Do not use the Save or Save As options. These options save one page at a time instead of a continuous PDF document. Some users may be able to take a scrolling capture in these web browsers. However, we cannot guarantee it will work for all users and in all versions. As an alternative, use the Custom Scroll profile. Internet Explorer users have reported that scrolling capture sometimes cuts off the very bottom edge of their capture or displays it as a black section in Snagit 10. Uncheck Use fastest scolling method option. Select Snagit > Profile Settings > Input > Properties > Scrolling tab. Uncheck the Use fastest scrolling method checkbox. Retry the scrolling capture in Internet Explorer. Scroll bars need to be visible to scroll chart sheets and, in some cases, worksheets Make sure the scroll bars are enabled in Excel. Snagit captures worksheets at 100% zoom and chart sheets at the current zoom level. 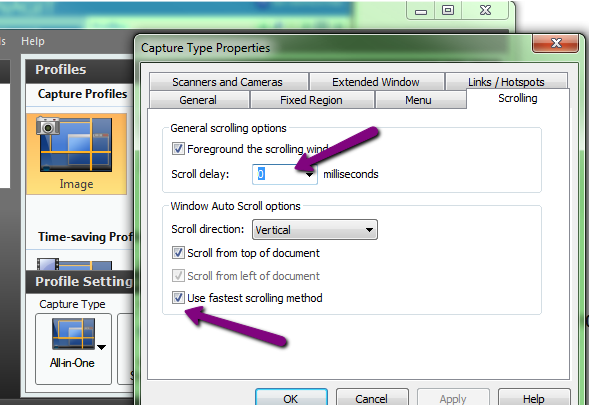 Snagit 10 and later can take scrolling captures in the Page Layout and Page Break preview modes in Office 2007 and 2010. This feature is not supported in previous versions of Microsoft Office. In Windows Vista, disable the Glass Theme to take a scrolling capture. Scrolling Capture of a specific pane or cell is not supported. Snagit cannot capture a cell that is being edited. All cells and panes to capture must be frozen. Scrolling capture has a maximum size of 32,766 by 32,766 pixels. Excel does not support Rich Text Capture to Clipboard. In Snagit 10 and later the Scrolling Region method is no longer available for Text Capture. This method can only be used with Image Capture. If text scrolling capture is failing in Microsoft Word, set the view settings to Print Layout view. In Office 2007, select View tab > Print Layout. In Office 2003, select View Menu > Print Layout. If the text scrolling capture is only capturing a few lines of text, use Custom Scroll in Snagit 11. If you have tried the suggestions above and are still unable to take a Scrolling Capture, contact TechSmith Technical Support. Customer reports and internal testing has shown that Kaspersky Internet Security 2014 interferes with scrolling capture. If running Snagit 12, please make sure that you have the latest version of 12.4.1 installed. We have seen known issues with Trusteer Rapport security software preventing scrolling from working. See this article for more information.